I'm so excited to finally reveal my first giveaway! I've been planning this for absolutely ages now (actually bought the prizes MONTHS ago when I got them for myself too) and with my 1 year YouTube anniversary coming up on Friday, I thought this would be the perfect time to launch the giveaway. 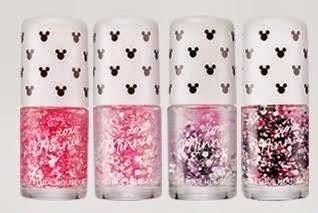 There's going to be two winners, who will each receive two of the Etude House Minnie Mouse Nail Polishes. The giveaway is open internationally so enter below! Closing date is August 29th so make sure to get all your entries in before then! Good luck! Oh, and if you're using the YouTube Subscription entry, make sure you have your subscriptions set to public so I can check. [UPDATE] Congrats to the two winners! I've sent you an email, if you don't see it make sure to check your spam folder too. You have 48 hours to send me your details, or I'll have to pick a new winner. Thanks so much to everyone that entered, stay tuned for future giveaways! I've been trying out Etude House's Baking Powder Crunch Pore Scrub over the last two weeks and thought I'd share my thoughts on it so far. In short: I love this stuff. The first time I used it, my skin felt so amazing that I just couldn't help but keep touching my face. My skin felt so soft. And clean. And all around amazing. I first used it the day I posted up my haul post (here). As I said in that post, I had heard that it was a really good product and I just really wanted to try it out. It comes as a pack of 24 pouches, each containing 7g of product. "Formulated with baking powder to penetrate, exfoliate and cleanse skin deep within pores to remove make up and residues. Scrub cleanser formulated with Peppermint to soothe skin. The directions were pretty simple: apply cleanser to wet face, lather and massage and then rinse off with warm water. It also says to use one pouch per application, and that is honestly more than enough. I think you could probably get away with using half the pouch for each application if you wanted to. So anyway, I ripped open one of the pouches and the first thing I noticed was the smell. Like holy crap, does this have a strong smell. At first all I could smell was lemons, but then I got a whiff of the baking powder too. I personally liked the smell, as strong as it was, but it's definitely going to put you off if you're not into strong scented products, or if you don't like the smell of lemons. After momentarily being stunned by the strong scent, I went on and tried it out (about time!). After I washed it all off, I straight away put on some moisturiser (Simple Kind to Skin Replenishing Rich Moisturiser - I freaking love this stuff!). I don't generally wear a lot of face make-up so I'm not sure how good this is at removing make-up. It is great as a cleanser & exfoliater though, and as I said above, my skin felt so clean, soft and smooth after using this stuff. My skin is a bit more on the dry side, and my forehead and nose tend to be the driest part of my face. I know most exfoliating scrubs tend to dry out the skin but I didn't find my skin feeling dry at all. I was actually really surprised at how smooth my forehead felt, no more of that slight flakiness I usually get. I used it again on Thursday of that same week and then Wednesday of this week. It says on the packaging to use once to twice a week, and since I have drier skin I think I'm just going to stick to using it once I week. Final verdict? Love this stuff. If you're interested, you can get it off eBay for €6.89 here!